Boutique style apartments, townhouses and villas in Kalkan on the Turquoise Coast of Turkey providing superior self-catering accommodation that offer our guests a relaxing holiday. This includes our very own boutique style apartments known as Truffle Residences. Truffle markets a handful of apartments, townhouses and villas in Kalkan to ensure our guests receive a high level of personal service both before their arrival and during their holiday. Kalkan is the ideal getaway nestled in the heart of the Lycian region on the Turkish Mediterranean coast. 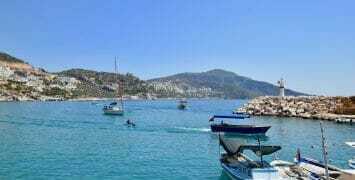 Picturesque walks along the narrow lanes filled with historic Ottoman architecture in the Kalkan Old Town, shops and restaurants galore, or even just sitting amidst the sounds of murmuring waves by Kalkan harbour, the town breathes genuine Turkish ambience. Each apartment, townhouse and villa has exquisite décor and design that can be characterised either as a fusion of contemporary and Ottoman sensibilities or modern contemporary – the choice is yours. Relax and enjoy your own private space and the amazing views and ambience of Kalkan. No breakfast deadlines, dinner dress codes, tipping or small talk required – just sheer indulgence. The perfect properties to holiday in Kalkan, The perfect place to holiday in Turkey.